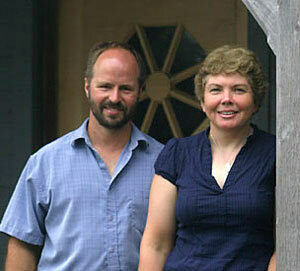 In 2001 we (Allyson MacDonald & Kevin Rivers) completed renovations of our century old farm house. The winter before we stood in our partially constructed living room ( only the post and beam was up, no walls ) and thought what a great gathering place it would be. We had been active in the local Canadian Foodgrains Project for several years and thought house concerts would be an excellent way to raise money for a good cause while having the opportunity to listen to great musicians in the privacy of our own home. Our concert series has evolved. Since 2003 we have welcomed dozens of professional musicians to our home. For these events the proceeds from the refreshments go to the Canadian Foodgrains Bank. Once a year we have an event where local musicians donate their time and talent, on that night the both the admission and refreshment money go to the CFGB. The house is located on an operating Century Farm just outside of Woodstock, On. Stonecroft Farms has been operated by the Rivers family since the 1800’s. Our mixed operation consists of beef, swine and cash crops, making excellent use of the land. Of course the farm also boasts 2 pet goats, 3 pet chickens and is the home base for MacDonald Mobile Veterinary Service. There are also 2 dogs and 2 cats in the house who have been known to take an active role in concerts!